I Have an Oven Thermometer! Brace yourself. Today’s post is pretty, pretty, pretty exciting. It’s not for the faint of heart. 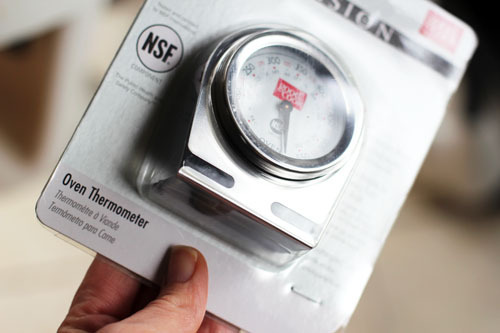 We’re going to be discussing…oven thermometers! Woohoo! For years I’ve been planning to try out the Artisan Bread in Five Minutes a Day technique and am just now finally getting my act together to give it a go! One of the “must-haves” in the book is an oven thermometer. Here’s the deal with me and cooking. I am not very scientific about it. I rarely get out my measuring spoons. I take shortcuts left and right. I’m surprised that the baking I do is successful, actually. My last oven cooked VERY unevenly and it ran cool and was basically a complete mess. 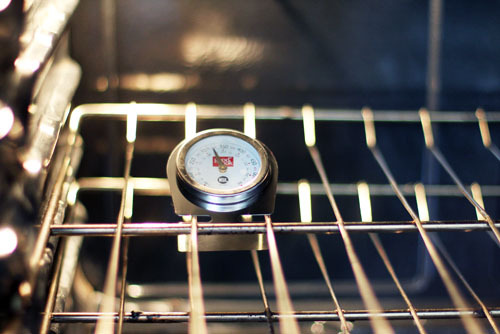 Did I ever bother to get an oven thermometer, to get a better idea of what I was dealing with? Nah, I just sort of felt things out. And, most of the time, it was fine, but I’m sure I would have had much better success with that oven if I’d at least known the temperature! Now that I will be attempting more baking AND since I’m using an oven I’m not familiar with, I’m going to stop messing around and get serious here! I bought an oven thermometer at the store yesterday and tested things out this morning. I set the oven for 350 degrees and let it preheat for a good half hour. And my oven was surprisingly accurate! It clocked out just under 350 degrees. Of course when I finally get a thermometer, the oven is actually pretty much right on. I am finding, though, that if I want the oven to be 350, I need to set it to 360. Interested to see what the higher temperatures will be like! Today’s homework, if you haven’t already done so, is to get an oven thermometer! They carry them at the regular grocery store, so no excuses! And when you DO get your thermometer, report back and let us know how your readings come out! It’s Super Bowl Sunday! 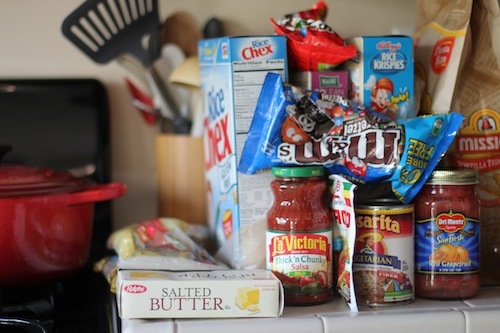 I don’t know about your countertop, but mine is stocked and ready to help me make some football-watching fare, including 7-Layer Dip and the decidedly devilish Sweet Chex Mix. Yum! And…Go Niners! It was SO GREAT to get back into a routine of making dinner this past week. Let’s see if I can keep up the momentum! You know the drill! Please share your menu for the week with us! Remember, plain or fancy, we love them all! Also, it’s okay to post later in the week, it’s never too late! Have a great week, everyone! Yesterday I promised you pizza sauce, so today I give you pizza sauce. 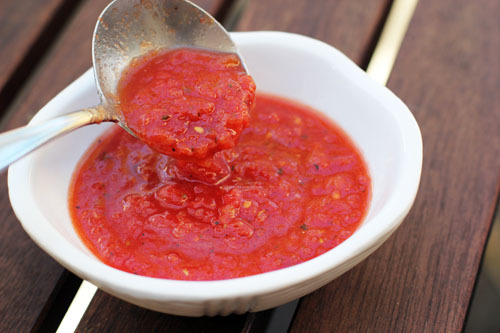 I’ll admit, when I make homemade pizza, I usually just grab a jar of pasta sauce from the pantry. Because I’m lazy like that. But the pizza sauce I made this week was so easy and so good that even my lazy bones could handle it. It’s homemade pizza sauce from here on out! America’s Test Kitchen has an episode about homemade pizza, trying to replicate New York-style thin crust at home. Now that I have my food processor, I finally gave the recipe a try. The recipe promised a no-bounce-back dough, no air bubbles and lots of flavor. I ended up getting a sort of bouncy dough, more air bubbles than I’ve ever had in any pizza crust I’ve ever made, and lots of flavor. That’s two strikes…at least it wasn’t an out, but it was definitely only a single! I obviously did something wrong along the way (ATK’s recipes are usually so fool-proof! ), but the process was super involved, so I probably won’t try that crust recipe again. I’m sticking with my pizza crust recipe. It’s easier and turns out great every time. But not all was lost on this experiment! 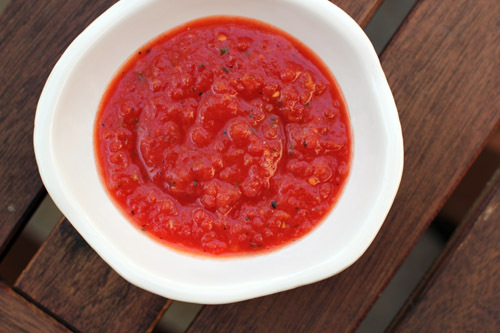 In the episode, ATK shared a quick and easy pizza sauce recipe that also utilized the food processor (I’m sure you could use a blender if you are food processor-less). People, this sauce is wonderful. It tasted awesome. It was so easy to make. It doesn’t cook until it is actually cooking on the pizza, so the flavor is super fresh. And I loved the texture – a small, uniform chunkiness that is perfect for pizza. I am super excited about this recipe and can see using it with pasta dishes as well! Add all ingredients to your food processor then process for 20-30 seconds. Refrigerate ½ hour before using on pizza.